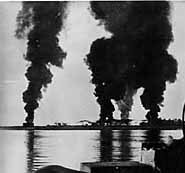 Ships Log "Orders received to evacuate Rangoon and blow it up. Demolition charges replaced, and arrangements made to blow. 09.30 Sailed down Rangoon River to "Dry Tree Point" where convoy anchored to evacuate troops. Brewer left behind to carry out part of demolition. 14.00 Demolition of Rangoon and amazing site - Terrific fires at oil refineries and wharfs. 80.000 tons oil fuel at one shot. Force Viper proceeded up the Irrawaddy, reaching Prome on 13th. Lt Kennedy RNVR "The military withdrawal from Rangoon was almost over. The Commodore left Rangoon in the 'Jessen' after the docks had been demolished, and was accompanied by Gandy and the rest of the MTB party. The "Jessen" was later commandeered by the Royal Indian Navy and re-named HMIS Barracuda serving as a depot ship during the Arakan campaign, and representing the coastal forces was in the the first wave of ships, representing the Coastal Forces, to sail back into Rangoon to witness the Japanese surrender on 12th September 1945. Lt Pittendrigh RNR was seconded into the British Indian Army with the rank of 1st Lieutenant. Arthur demobilised in 1945 with the rank of Major. He returned to Hong Kong to command the Maritime Police Service with the rank of Colonel. The Japanese entered an eerily quiet and deserted Rangoon. Lt Collingwood stayed on the "Heinrich Jessen" which set sail immediately for Akyab (Sittwe) on the Arakan coast of Burma in the Bay of Bengal where he then took command of an R. I. N. sloop assisting refugee relief. 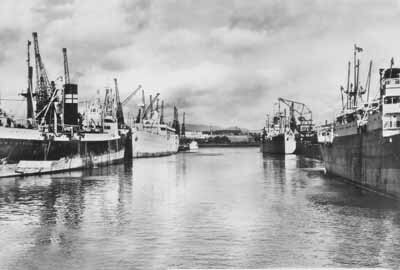 Lt Kennedy RNVR "When we returned to Akyab there was considerable activity in the port, and the 'Clan Murdoch' lay alongside the quey discharging a load of bombs for the RAF. Later the same day when I was ordered at short notice to embark in the 'Ellenga' with my ratings for Calcutta, it looked as though we were just a step ahead of the Japanese once more. Gandy's party boarded the train for the thirty six hour journey across the Indian sub-Continent to Bombay. Leaving Calcutta station was an experience never to be forgotten, with people crossing the line with just inches to spare. Others hanging on externally as the engine began to pick up speed. The scenery was everlastingly interesting and at times the train overtook wandering elephants walking alongside the railway. Gandy and party arrived at "Victoria Terminus", now CST the most magnificent building in Bombay, at 10.00. Gandy, Ashby, and the party of ratings boarded the sixteen thousand five hundred ton former Peninsular & Oriental (P&O) 1st class luxury liner "Narkunda," now armed, under the command of Captain M G Draper. The SS Narkunda slipped and proceeded at 1530 bound for Durban along with survivors from the two Capital ships "HMS Prince of Wales" and "HMS Repulse," that had been sunk by the IJA on the 10th December 1941. 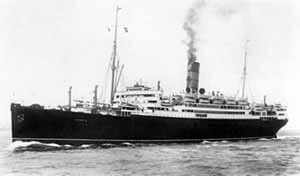 Lt Kennedy RNVR "There was just sufficient time before being bundled on board the twenty-thousand ton Cunarder 'Laconia' to change our Burmese money and do some very necessary shopping. I collected my orders as 'Officer Commanding Naval Draft', a somewhat pompous title for there were only fifteen ratings on board. The Narkunda arrived in Durban to take on board 657 Italian POW's. Lt-Commander in charge of Naval draft guarding 657 Italian POW's on board the Narkunda on passage to UK. HMT Narkunda departs Durban en route to UK via Cape Town. 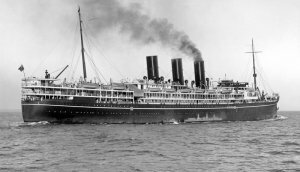 Lt Kennedy RNVR "The "Laconia" was followed into harbour (Cape Town) by another troopship, the "Narkunda", and to our surprise Gandy and the other half of the MTB party were on board. We had not expected to be ahead of them, but they had called at Durban to embark Italian POW's. We were ordered to transfer and so all joined forces again after an interval of two months. The "Laconia" party received a warm welcome, perhaps not so much as old ship-mates but as extra hands to share duties of guarding the six hundred Italian prisoners-of war being taken to England in the ship. Sub-Lt Tommy Brewer stayed on in Burma serving on ML1104 gaining an MiD in June "For Bravery and Resolution while serving in Burma." along with five fellow Burmese RNVR officers in 1942. The officers were able to purchase new uniforms in Cape Town from the military tailors A H Bruce & Co (PTY) Ltd at GB£12.00 each. 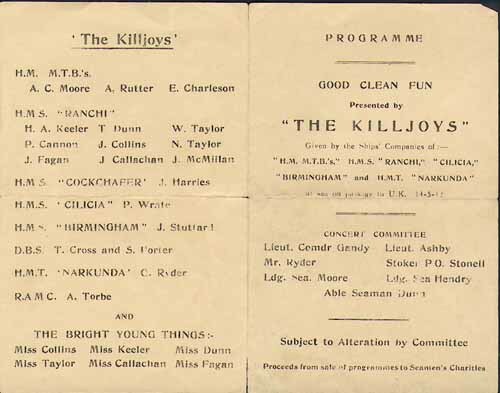 A concert called "The Killjoys" arranged and organized by Lt-Cdr Gandy, Lt Ashby, PO Stonell, & L/S (Pony) Moore and was performed by the ships companies onboard of HMTB's, HMT "Narkunda", HMS "Ranchi", "Cilicia," "Cockchafer," & "Birmingham" The performers from the MTB's were (Pony) Moore, Al Rutter, & Eddie Charleson. As they headed north, frequent life boat exercises were carried out and the order to sleep fully dressed was given as they negotiated the U-boat packs in the north Atlantic, continuously zigzagging en route for the UK. PO Buddy Hide immediately made arrangements to marry his long term girlfriend, they married the following week. After a short leave he was posted back out to the Far East. Two ratings remained in Calcutta with the Department of Medical services (DMS). One rating remained in hospital in Calcutta. Lieutenant Commander Gandy R. N. (Ret) had prevailed against all the odds, and triumphed over adversity to deliver his people back to freedom without loss of life or serious injury after evading capture and escaping from Hong Kong on Christmas Day 1941. This epic escape proved to be the pathfinder for several thousand further Sino/British POW and civilian escapees from Hong Kong. The escapees were sworn to secrecy regarding the route and the fact that special forces were involved, and as such remained as classified information for thirty years, and was only officially released from the British National Archives in 1972. Commander Ron Ashby DSC VRD RNVR as Commanding Officer of Coastal Forces in the 2nd Arakan campaign under Admiral Lord Mountbatten played a most significant part in the re-taking of Rangoon, Singapore and Hong Kong from the oppression of the Japanese. To this end the Arakan Campaign, led by Admiral Lord Mountbatten and General Sir William Slim, was of vital importance.